Cat Fight is back for an awesome second year, and you know what that means – a second year of Telethon! Did you know that, every week, when I’m planning my playlists, I delve into a massive library of thousands of CDs, records, MP3s, and cassettes in search of music? It’s every DJ’s dream! Such a remarkable music collection would not be possible without the continued contributions of WRUW’s listeners. This is the one time a year that we ask you, our listeners, for help in continuing this station and everything wonderful it does – from live weekly performances and insightful public affairs shows to Studio-a-rama and other community events. Without WRUW, you wouldn’t have the option to listen to cat-themed radio programs showcasing women in rock! Update: I have surpassed my $500 goal… and it isn’t even showtime yet! As a result, I’m raising my goal to $1000. Let’s do this, people! 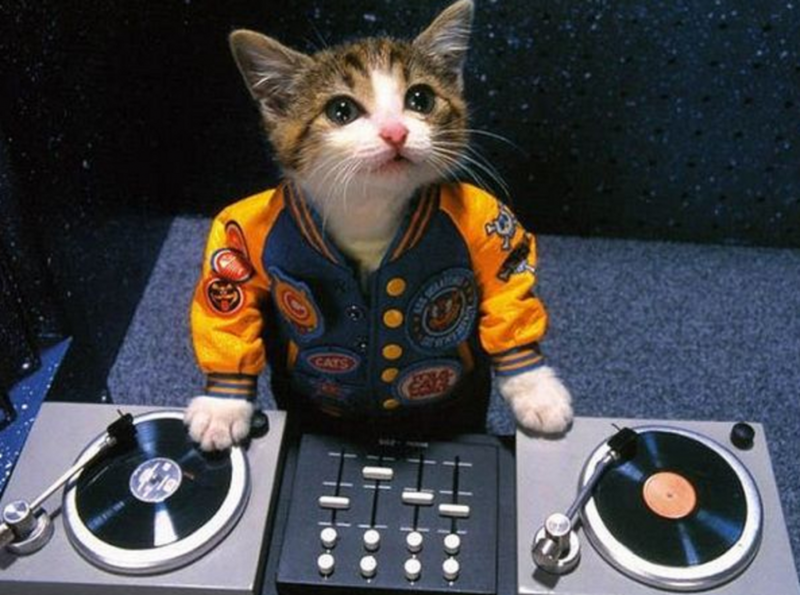 A rare picture of your favorite feisty feline struggling (as usual) to get the turntables prepped and ready in time for the broadcast.